HARLOW’S prospective parliamentary candidate, Laura McAlpine, has indicated her support for a bid to oust Liverpool MP, Luciana Berger. Ms Berger, who twice visited Harlow in 2014, was the subject of a proposed vote of no confidence in her Liverpool Wavertree constituency. Many fellow MPs came to Ms Berger’s defence including Yvette Cooper, Ed Miliband and Tom Watson. Deputy leader of the Labour Party, Tom Watson accused the Labour members who were planning a vote of no confidence in Luciana Berger of “bringing disgrace” on the party. Ms McAlpine had “liked” a tweet by left wing commentator, Aaron Bastani. One Labour activist @Labourdave disagreed with Ms McAlpine’s “like” He said on Twitter: “I ask Harlow Labour PPC to withdraw her “like” icon and stand with us with Luciana”. On Friday afternoon, the motion was withdrawn. Ms Berger, a Jewish woman, has been high critical of Jeremy Corbyn’s handling of antisemitism in the Labour Party. Ms Berger has been the victim of horrendous antisemitic abuse. She was even given police protection at a Labour Party conference last year. YH contacted Ms McAlpine for a comment but she had not replied at the time of publication. 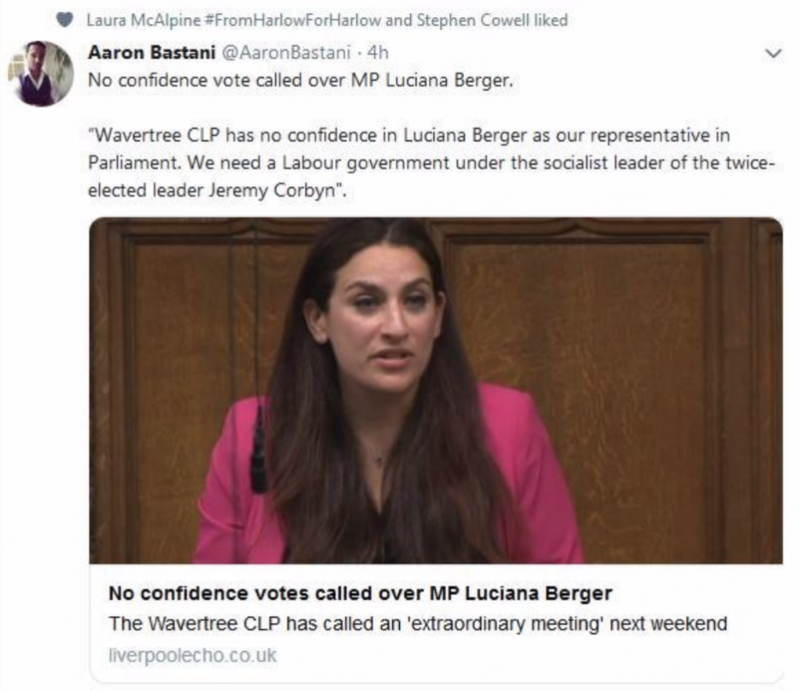 12 Responses to "Harlow’s Labour candidate Laura McAlpine “likes” vote of no confidence in Labour MP Luciana Berger"
Sorry, is this the no confidence vote that has been pulled and now an investigation is being launched into bullying. Yes, Laura, we’ll done, you’ve backed an utterly horrible decision by your own party. With views like this you are totally unfit to be elected. Typical of this sniping odious woman, who seems to delight in stirring up bias and resentment to-wards what she envisages, are party members who aren’t fit, or fail to qualify for the Momentum mob. But, I do believe that she is married to an Egyptian, so she probably follows his theory about what is best for the Jewish people, in or out of Parliament. Is she really the best that the Marxists can offer ? Pity that the errant lady didn’t wait before getting on this band-wagon. The motion has been PULLED. Why should she not ‘like’ a tweet for that comment alone? nature about ‘cheap shots’, he certainly is an expert in that department. Totally unfit to represent anyone, now, or in the future. MickyB77, is there any truth to the rumour that you are in fact Peter Lamb, Conservative candidate for Staple Tye? A potential voter wants to know. Total foot in mouth job, as usual. Answers to Y H please. Still waiting MickyB77. In the interests of full disclosure, if you are indeed Peter Lamb, this Staple Tye voter wants to know. So Pytr, your response to what you claim is a cheap shot is to fire an equally offensive cheap shot back at those who disagree with you. The term gammon is really quite offensive to a group of people, and for the record, I’m not old enough to be a gammon. Yet despite this I find that a labour candidate who supports a which hunt against another MP probably because of her religion is actually really out of order and news worthy. Just as much as Halfon’s aid meeting people who’d quite happily suggest killing other MPs. If you’re going to complain about people being offensive, don’t be offensive yourself. Frankly since the Labour Deputy Leader got involved with this disgraceful backstabbing of one of the more gifted Labour MPs, threatened to disband the Constituency Party, and got this no confidence vote stopped, perhaps someone should tell him about the Harlow Labour Candidate liking this no confidence vote! I mean she is backed by this nasty bunch Momentum, and got four of her own Councillors kicked out last year. Four by elections paid for by Harlow Residents just for backstabbing! Labour really are unfit for public office! Why they backstab each other, perhaps Harlow Residents should give their votes to someone else who might actually represent them and their wishes! 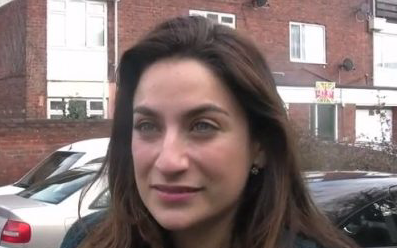 The antisemitic abuse of Luciana Berger is a terrible indictment of the hateful political scene at the moment and so Luciana deserves our solidarity in combating the abuse she receives. However, four members of Liverpool Wavertree CLP called for a motion of no confidence in Luciana for two reasons: firstly, her political views which are from the right-wing Progress faction and secondly for her repeated criticisms of Jeremy Corbyn seen by many as disloyal. Liverpool Wavertree has grown considerably under Jeremy Corbyn’s leadership to 1700 members and consequently the old Blairite/Progress politics of privatisation and destructive wars for oil are not popular. Luciana stated at the Labour conference Progress rally in September last year: “There must be a better answer than 70s-style nationalisation.” Well the conference voted for renationalisation of water, rail, energy suppliers and Royal Mail. The disasters of outsourcing public services to companies like Carillion and the ongoing service problems with privatised rail, prisons and probation highlight the need for directly state owned and managed public services that treat their customers and employees with respect. Luciana Berger’s support for the discredited policies of the Blair years and her constant sniping at Jeremy Corbyn are out of step with the new, younger members of her local party who face a bleaker future than their parents generation. Laura McAlpine liking the tweet for political policy reasons is fine, but I find it disgraceful that this is then used to insinuate her lacking empathy for antisemitic abuse. I have no doubt that Laura is not condoning the dreadful abuse Luciana Berger has so unjustly received. Harlow_TUC, interesting comments so thank you for pointing some of it out, and good on you for your views on anti semitisim. But it does back up the point that the Labour Party is forcing people to take a more left wing approach to politics and all be as one. Even some MPs in other parties range from left to right on issues. If she’s generally a good MP for the area then there is no need to hound her out, and doing so just because a load of left wing people don’t isn’t right. See is right to question her leader if she see’s things not quite right, as any MP should. I would like to point out that privatisation isn’t all bad and disastrous as you make out, in fact one could argue the opposite that public ownership and lack of investment has actually left decades of under funding to repair. lets look at Water and Electricity. Many of the pipes used are up to 100 years old and power lines up to and above 40 years old. Because of a lack of investment in infrastructure during public ownership and running things at the lowest cost base has lead to this problem which has caught up with us now, especially as these companies operate in a profit and spend cap environment run by OFGEM and OFWAT and set up by a Labour government. It makes it hard for them to allocate the right funds to fixing problems if they have no flexibility. As for trains, sadly yes too investment needs to be made in a network crumbling with age and unable to keep with the current level of demand. Sadly this costs money. I as much as you lament the high salaries by executives, seemingly delivering poor services, but given what these companies are up against, I can understand higher prices. Also, higher prices reflect higher living costs and salaries of those working for them, many of which are grossly over paid. Under public ownership, there is no guarantee of where any money is made goes back to (probably treasury) so reinvestment into the network is limited. Even if the companies build this into plans, it’s not safe, so I fear we’d see a similar decline under public ownership. To your last point, perhaps Laura should clarify her position on this. However, if above it’s because she doesn’t like her centrist politics, then actually it’s none of her business, it’s up to those in the area who have voted for her again and again. Also, now that this activity has been deemed as bullying then no, it is not fine to support this. Although I do hope that is the case and not part of this refusal to deal with this problem within the Labour Party.